In silvers and golds, slate grays and whites, attendees of this year's Academy Awards red carpet seemed to be channeling the angels. Stylists doused Hollywood's top divas in glittery, icy confections, and all they needed were wings. Should heavenly escape not have been the intent, those dresses still were absolutely beautiful. I couldn't get enough of Hailee Steinfeld's dazzling, haltered Ralph & Russo gown. Karlie Kloss was stellar in Stella McCartney. Jessica Biel's KaufmanFranco was goddess-like. And Chrissy Teigen's tight Zuhair Murad was so radiant, the new mom was nothing short of beatific. 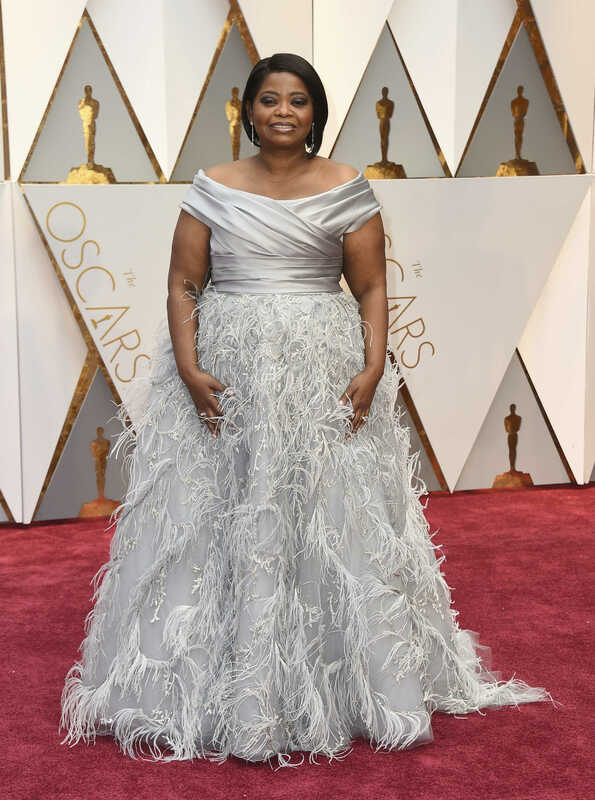 And there was no such thing as too many feathers on Octavia Spencer's Marchesa. But color stunned at the Oscars, too. Kirsten Dunst's strapless, Dior was a close second: she looked fabulous. And Taraji P. Henson's navy blue velvet — complete with knee-grazing slit — was a head-turner. Those were the hits. But the misses? Janelle Monae disappointed in Elie Saab Haute Couture, and Dakota Johnson bombed in Gucci (which should be impossible). The red carpet, however, wasn't without politics as celebs like Negga, Busy Philipps, and Casey Affleck chose blue ribbons as accessories — an ACLU initiative to protest President Trump's travel ban. 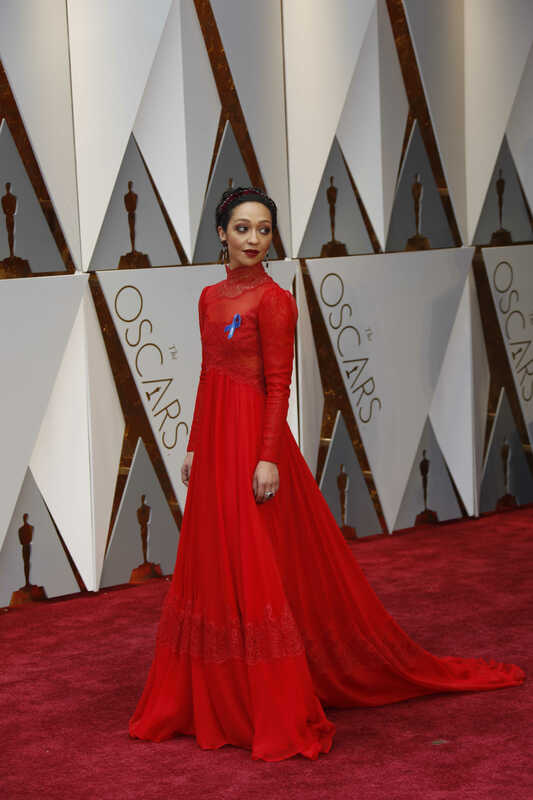 Ruth Negga's long-sleeved red Valentino was a must-have. Olivia Culpo's Marchesa gown was inspired by waterfalls. Chrissy Teigen, husband of Penn grad John Legend who will be performing tonight, said her glittery, white Zuhair Murad gown fits tight, but the look is alright. Hailee Steinfeld's Ralph & Russo couture is a halter-necked slice of floral perfection. 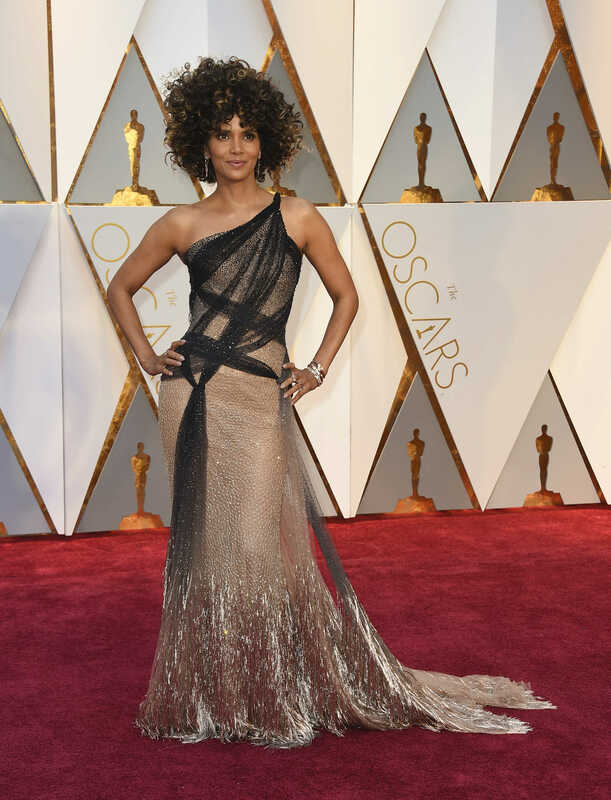 Halle Berry in Versace: Hair is fab. Dress is drab. Karlie Kloss looks stellar in Stella McCartney. Emma Roberts' color-blocked, vintage Armani Prive? Not so much. Octavia Spencer in a slate Marchesa with feathered skirt. 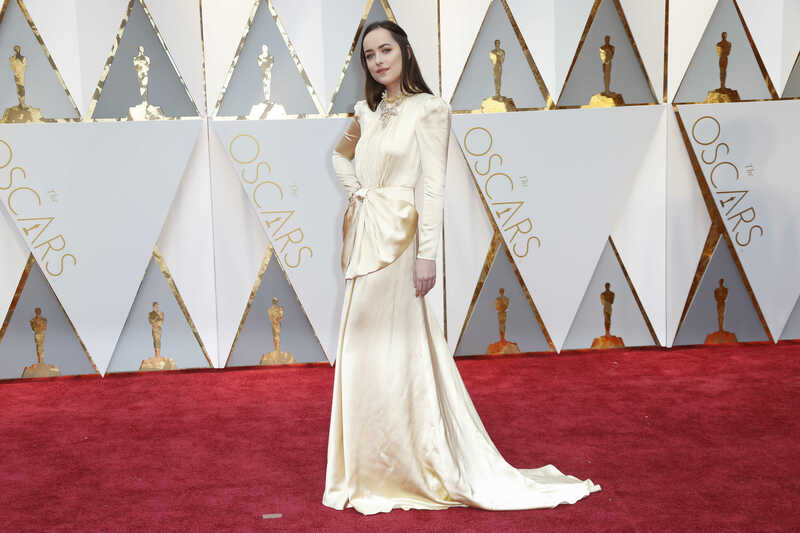 Dakota Johnson's gown: an awful Gucci. 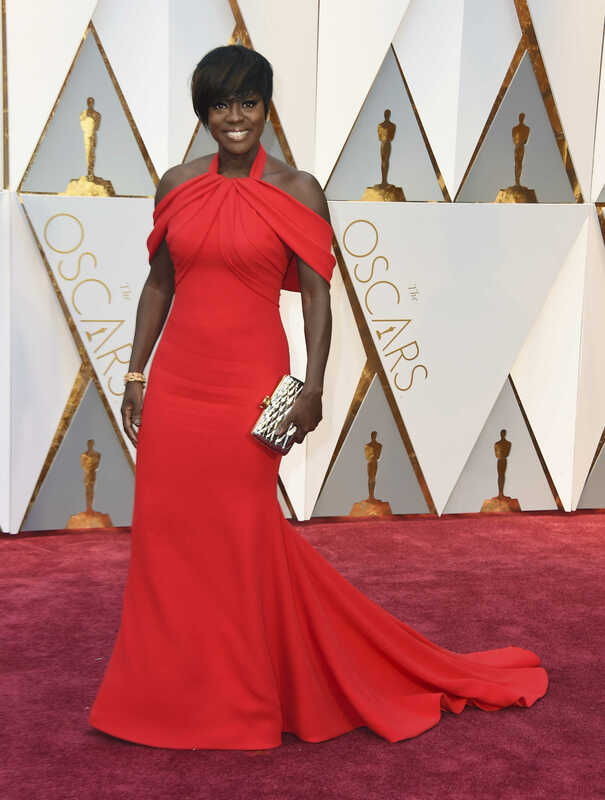 Viola Davis slayed the red carpet in this fitted off-the-shoulder Armani Prive. Ooh la la.